In the year of 1985 two coming-of-age movies came out by the names of The Breastfast Club and St. Elmo’s Fire. These were my two favorite movies back then and still are. For some people out there that don’t remember these two movies, should watch them, because they are classic. The Breakfast Club movie was written and directed by John Hughes. 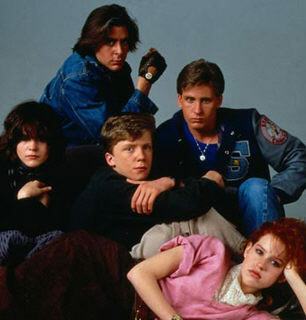 The story is about five teenagers from different high school types that we all can relate too, like Claire Standish (Molly Ringwald) the princess, John Bender (Judd Nelson) the criminal, Andrew Clark (Emilio Estevez) the athlete, Brian Johnson (Anthony Michael Hall) the brain, and Allison Reynolds (Ally Sheedy>) the basket-case. Who had to spend their Saturday morning in detention and at the end they discover that they are not much different after all. It was released in February 15,1985. The St. Elmo’s Fire movie was directed by Joel Schumacher. The story is about seven friends who just graduated from college and are finding out that the responsibilities as adults are not as easy as it seems. Some of them are just figuring out who they are and some are figuring out their love relationships. It stars Judd Nelson, Ally Sheedy, Rob Lowe, Demi Moore, Emilio Estevez, Andrew McCarthy, and Mare Winningham. It was released in June 28,1985. You can get these movies at Amazon.com. Comments for The Breakfast Club and St. Elmo’s Fire Are Two Best Movies from the 8O’s are now closed.